As your summer vacation draws near, you’re most likely making lists for packing and working on an itinerary for your trip. Whether you have your days mapped out or are simply planning on winging it, Modern Pest Services encourages New Englanders not to overlook a very important matter that could make or break your their much needed getaway. Bed bugs. That’s right; these tiny insects are still continuing to infest hotels in destination cities around the country. And what’s worse, if you don’t know how to avoid bed bugs during your vacation you could very well bring them home with you. 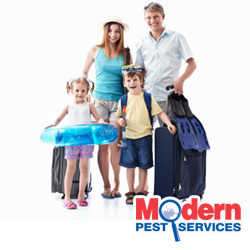 Here at Modern Pest Services we’ve put together 7 of the top bed bug prevention tips that can help you avoid bringing bed bugs home as a vacation souvenir. Before you leave, check online at the Bed Bug Registry to see if your hotel has had a recent bed bug infestation. But keep in mind that infestations are usually dealt with immediately which means that a problem from the past does not necessarily mean you need to cancel your reservation today. When packing, pack clothing in large bags that seal shut. So even if a bed bug or their eggs get onto your luggage, your clothing inside will be protected. Upon arrival at your hotel, keep your belongings outside until you have thoroughly checked the room for any signs of bed bugs which include: small blood spots on the mattress or linens, as well as light brown colored skins which are shed as they grow into adults, and of course live bed bugs themselves. Use a flashlight to inspect the other, more hidden areas of the room. This includes places like the nightstands, the edge of carpets, baseboards, upholstered furniture, and even near electrical outlets. Once you have landed in a bed bug-free hotel room, it’s a good idea to continue to keep your clothing in bags and keep your luggage up off of the floor (on a luggage rack) just to be safe. When you arrive home from your vacation, be sure to perform a thorough inspection of your luggage, send your clothing to the wash right away, and vacuum out the suitcases before storing them away. Continue to inspect your home after your vacation for any signs of bed bugs. Sometimes it takes a while to notice an infestation as bed bugs are great at hiding. Although bed bugs in hotels are a real worry, you can pick these pests up just about anywhere. In fact, they have been reported on airplanes and in other modes of public transportation as well as in other types of commercial establishments. We urge you to our follow tips before, during and after your vacation to keep it relaxing and bed bug free. If you suspect a bed bug problem in your home or business, contact Modern Pest Services at 1-888-997-3312. We offer a comprehensive bed bug control program including canine inspections, heat treatment, prevention tips and training.